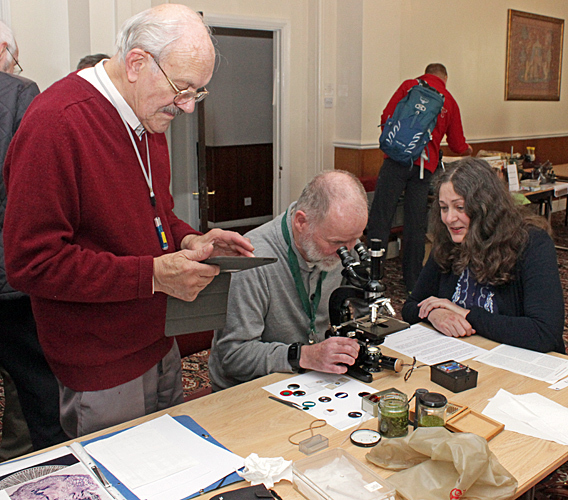 Mike Woof organised another well-attended joint meeting of the Quekett and the Postal Microscopical Society, held again in 2 rooms at the Haling Dene Centre in Penkridge, Staffordshire. 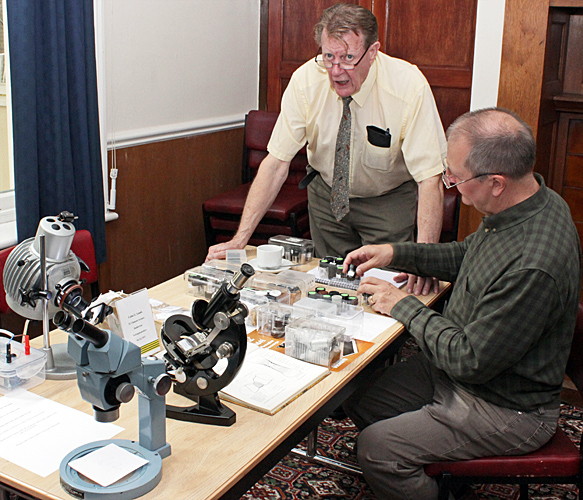 The morning was given over to exhibits and sales (items ranging from filters and bulbs to trinocular microscopes), and the afternoon was given over to 3 lectures. 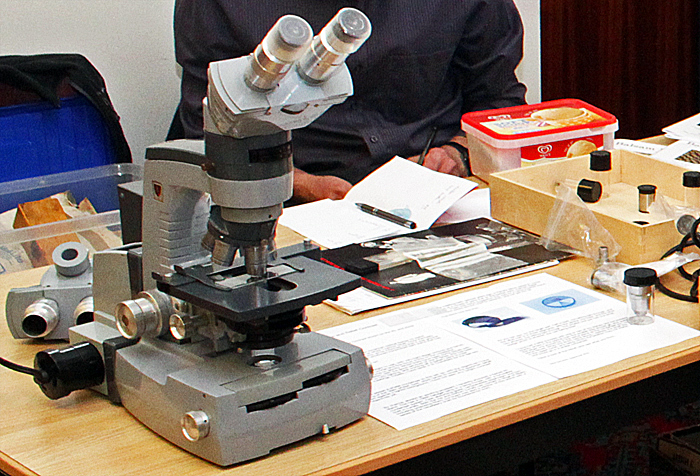 John Fletcher used a black and brass monocular Watson microscope to show some microphotograph slides by J. B. Dancer. 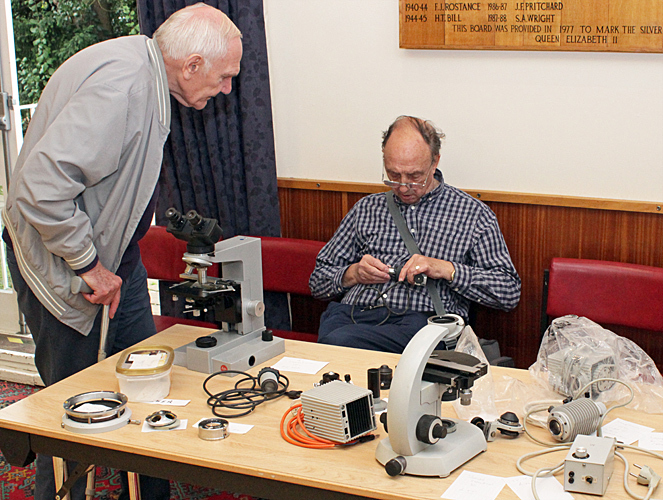 John also showed a copy of The Microscopic Photographs of J. B. Dancer by Brian Bracegirdle & James B. McCormick, a book that is normally expensive but that is available to Quekett members for just £10 plus postage. Les Franchi demonstrated Variable Asymmetric Rheinberg Illumination using his Zeiss Jena microscope that allows the substage condenser to be offset by turning a knob. Les brought several slots and stops that fit into the filter holder and provide enhanced contrast and depth discrimination. 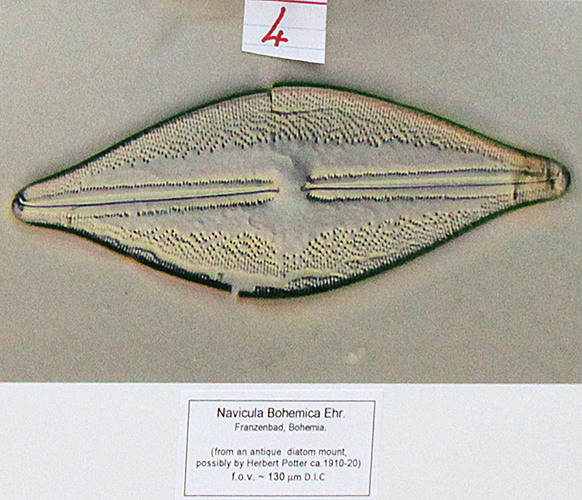 To show the effects, Les used prepared diatom slides and some live freshwater material. Terry Hope brought some pathology slides prepared in Leeds in 1920 of pernicious anaemia, syphilis, anthracosis, tuberculosis, silicosis and diphtheria, diseases that have almost disappeared from the United Kingdom. At first, Terry couldn’t see anything through his Zeiss Universal, but with plenty of expertise available the problem was soon resolved. Colin Lamb showed a large Wild lamphouse that he had converted to LED and mounted on a stand so that it could be used with microscopes that have a mirror. 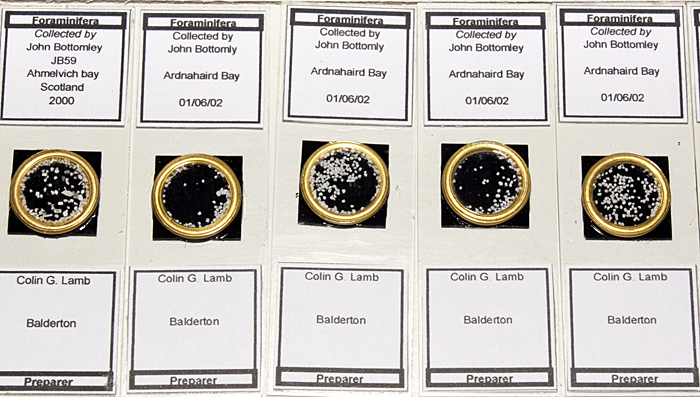 Colin also showed lots of dry mounts of forams that he has recently made. The black squares are painted coverslips, and the gold-coloured rings are brass curtain rings! Geoff Mould bought one of the popular Chinese inspection cameras and found that the stand is poor, so he assembled an alternative using a rigid copying stand, a focusing rack and a mechanical stage. He also showed a pair of LED lights on self-supporting arms for top light, two light sources for transmitted light, 2 tilting stages for specimens and jewel tweezers (gem forceps). Geoff also brought an album of photographs of the late Doug Morgan. Robert Ratford was giving away samples of sand from various locations that included material of biological origin such as shell fragments and sea-urchin spines. Mike Samworth used his recently-acquired American Optical AO 20 microscope to demonstrate relief contrast with 2 discs that may have been intended for a Leica inverted microscope. 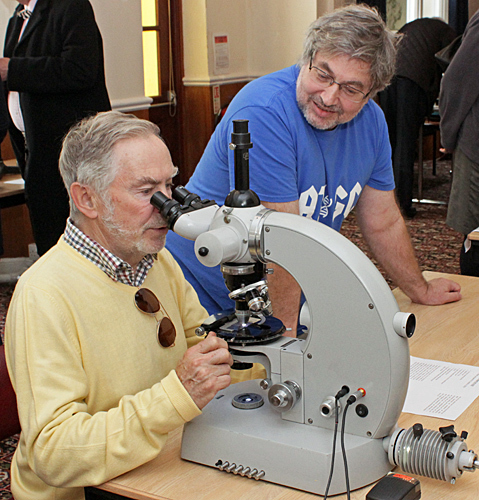 Ray Sloss showed a Steindorff Microbe Hunter, an unusual microscope that was seized up when he bought it but that he had cleaned and lubricated and converted to LED illumination. Now that it is working, he has mixed feelings about it. On the plus side, the stand is solidly built, it has a 6-position nosepiece and a versatile condenser. On the other hand, it is difficult to centre the illumination and the condenser, the fine focus cannot be adjusted for backlash, the factory centering adjustments are overly complex, and the optics are very average. 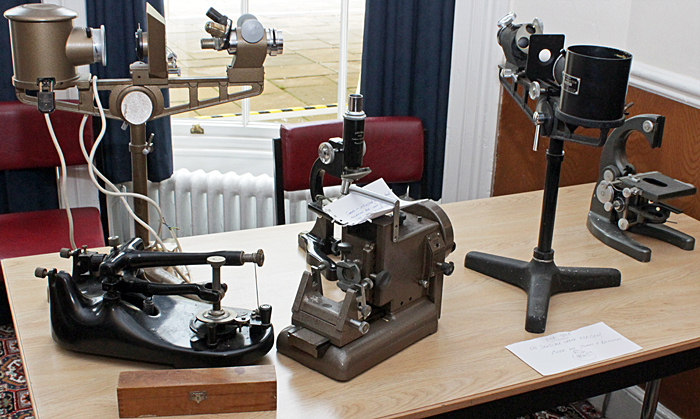 James Battersby was selling items including a large Beck rotary microtome (snapped up by Gordon Brown), a Cambridge Rocking Microtome, a small but heavy Flatters & Garnett microtome and two Flatters & Garnett microprojectors. 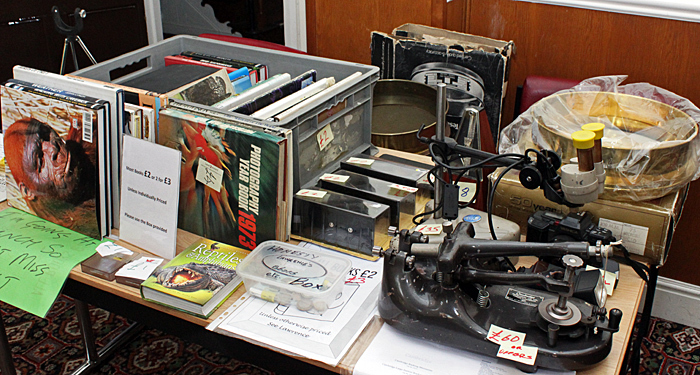 Lawrence Hartley’s items included a Cambridge Rocking Microtome, a stereomicroscope, lots of books and some brass sieves. John Judson had a variety of items in various stages of completeness. 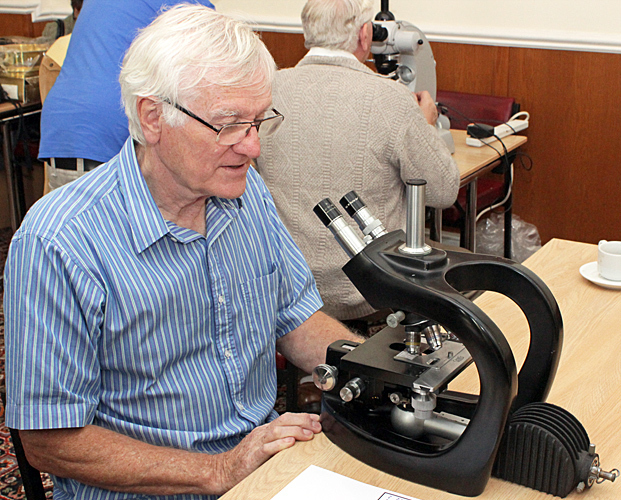 Chris Kennedy was selling items to raise money for the RMS Schools Microscope Fund, including an Olympus IM inverted microscope equipped for phase contrast, an Olympus PM10 camera, a Reichert metallurgical microscope and two small Swift microscopes. 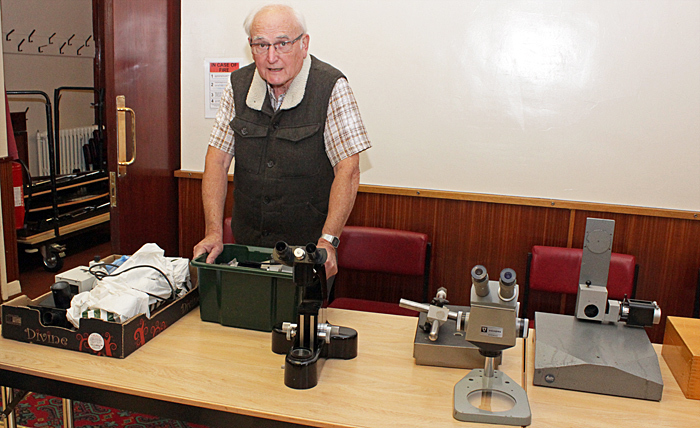 Colin Lamb was selling a black and chrome Zeiss monocular microscope, and a Vickers M41 Photoplan microscope, plus several boxes of eyepieces and objectives that belonged to the late Les Larkman. 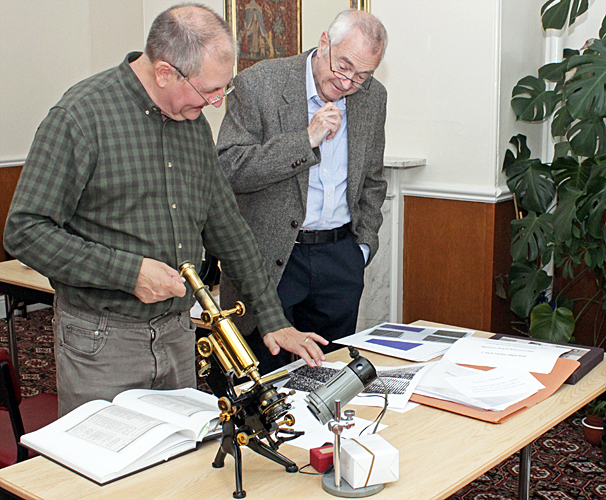 John Millham had a good range of microscopes and lenses, including some recent Nikon objectives and condensers. 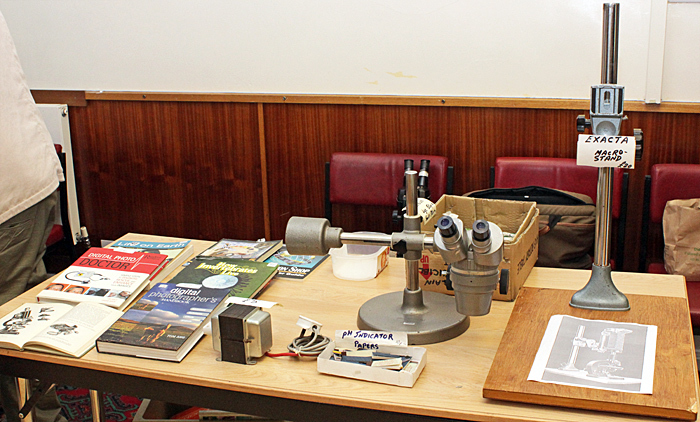 Geoff Mould brought an Olympus SZ stereomicroscope on a very heavy boom stand, an Exacta stand intended to support a camera+bellows above a microscope, some books, a transformer, and some pH indicator papers. 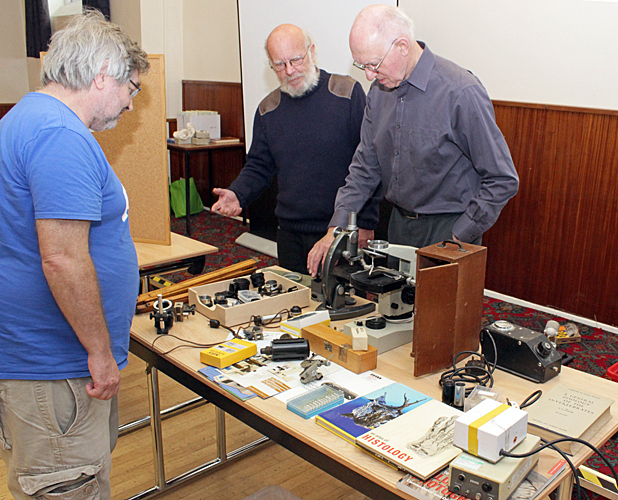 Mike Samworth was selling more items from the estate of Steve Edgar (including items recently found in his loft), including a Vickers polarising microscope, several stands, assorted objectives and eyepieces, books and power supplies. Spike Walker had a Zeiss Standard stand, assorted other Zeiss items, and a complete binocular Leitz SM-Lux. 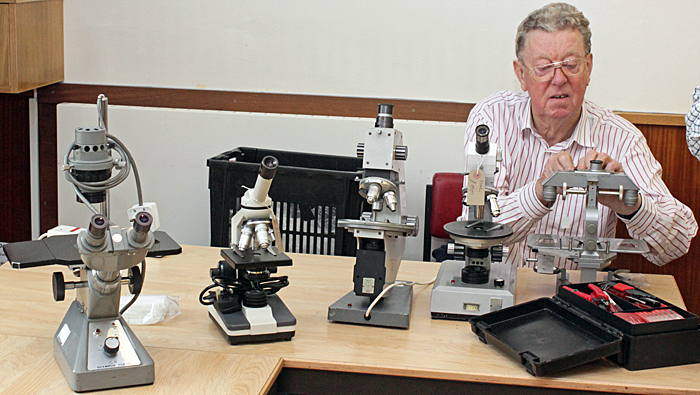 Paul Wheatley had fewer items than usual, including a new Chinese microscope, an Olympus CK inverted microscope, two Swift polarising microscopes and an unusual comparison microscope. 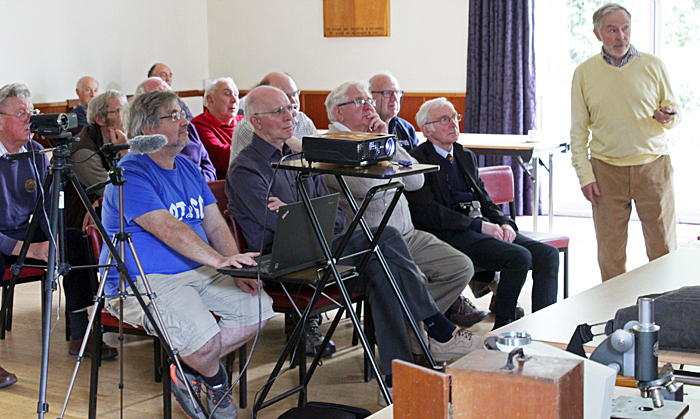 Robert Ratford recorded the 3 talks, and we hope to make them available on the website when they have been edited. 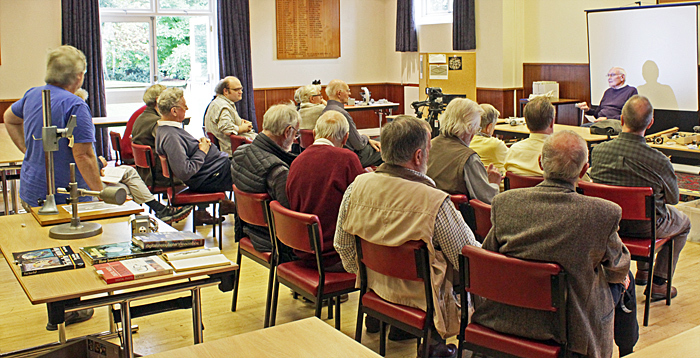 John Birds talked on “Collecting clutter”, based on his experience of working at Chatsworth House. They have hundreds of rooms and rarely throw things away, and John had seen candles, brass candlesticks and gas lamps from before the days of electric lighting, low-voltage light bulbs used when turbines in the water supply for a fountain were used to generate electricity, lead musket balls covered in white powder, the first copy of The Times newspaper and the one announcing the death of Lord Nelson, and a trunk of mink, sable and beaver coats that moved because of all the carpet beetles. There was also a large set of books, not in the library, that included one on fungi by M. C. Cooke. John’s theme was that if you keep things long enough they become valuable, and should be regarded as items of delayed value, not clutter. Terry Hope spoke on “Golgi versus Cajal, a race to the Nobel prize”. Camillo Golgi (Italian, 1843–1926) and Santiago Ramón y Cajal (Spanish, 1852–1934) were neuroscientists who both developed stains for nerve tissues and proposed theories on the arrangement of the nervous system. Terry told us lots about their early lives, their careers and their competing theories. In 1906 they were both awarded the Nobel prize for their work on the structure of the nervous system. 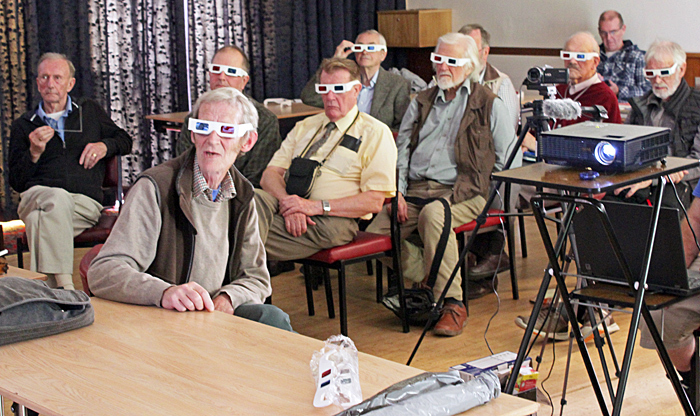 John Ward spoke on “Diatoms in 3D”. 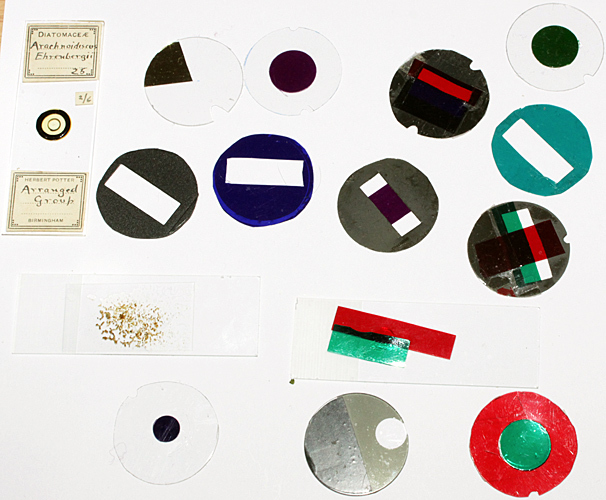 He has a large collection of diatom slides by J. D. Möller, several of which he has photographed in 3D, and he passed out red/blue anaglyph glasses so that we could view them. Most of them were taken with Zeiss plan achromat 40× and 100× objectives using DIC on his Photomicroscope. John went into a lot of detail about the masks that he uses to partly obscure the Ramsden disk and obtain stereo images from a binocular microscope; the size and shape varies with magnification and NA. Some of the holes in the masks are tiny, and John uses drill bits from 0.3 mm up from sets available in model shops. John showed us photos of his equipment, which allows the masks to be adjusted independently of the microscope and the camera, and then the SLR camera can be focused on the mask. For preparing the 3D images, he recommends a free program, StereoPhoto Maker.